"This healthier version lets you enjoy sweetness from the peaches, not added sugar." Combine peaches, 2 tablespoons brown sugar, 1/4 teaspoon cinnamon, nutmeg, lemon juice, and cornstarch in a large bowl. Toss to coat evenly, and pour into a 2-quart baking dish. Meanwhile, combine flour, white sugar, 1/4 cup brown sugar, baking powder, and salt in a large bowl. Blend in butter with your fingertips or a pastry blender until mixture resembles coarse meal. Stir in water until just combined. Mix together 2 tablespoons brown sugar and 1 teaspoon ground cinnamon. Sprinkle entire cobbler with the sugar and cinnamon mixture. Bake until topping is golden, about 30 minutes. This recipe is a healthier version of Southern Peach Cobbler. I didn't have whole wheat flour, but I did like that it is lower in sugar. 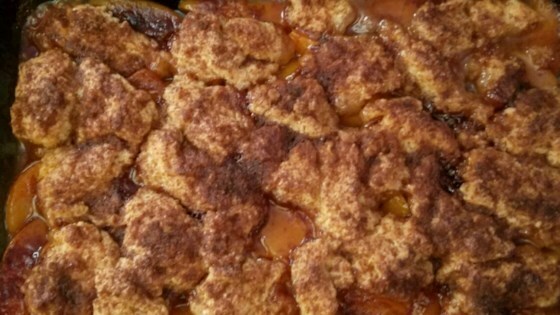 Best peach cobbler I've ever made! Super yummy. I did add oatmeal to the cobbler mixture. Definite keeper. I used Splenda brown sugar blend instead of regular brown sugar but used the same amount. Turned out fabulous! I had to give out thirds!